A high-strength, multi-strain probiotic bowel bacteria combination with 4 billion organisms per capsule (equivalent to 8 pots of probiotic yoghurt, but without the sugar, dairy and fat). 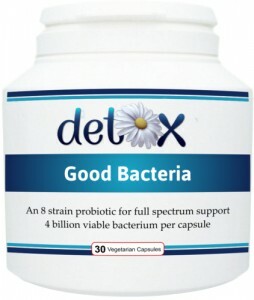 It provides 8 strains of friendly lactic bacteria which should inhabit a healthy gut and offers full spectrum support of the upper and lower bowel. Encapsulated for acid resistance, this probiotic has been specifically formulated for natural health practitioners who treat digestive and intestinal disorders. It is ideal for use following antibiotics, travelling abroad and colonic hydrotherapy treatment. Also available in 20 billion MAX strength - ProBiotic MAX. Contains human strain bacteria. Guaranteed to provide 4 billion live bacteria per capsule for up to 12 months. If Good Bacteria is taken alone (as opposed to in combination with other digestive health supplements), start off with a higher intake of 3 - 4 capsules, split up throughout the day with food for 2 - 4 weeks. Thereafter, intake to be reduced to 1 capsule, 1 to 2 times per day. is taken continuously for 2 - 3 months, together with improved eating habits. NOTE: Included in each pot is a small food grade approved sachet to ensure the product remains unaffected by moisture after it is opened for use. As stated on the sachet, this is not to be eaten.